And they'll probably get it. It was bound to happen and it finally has. 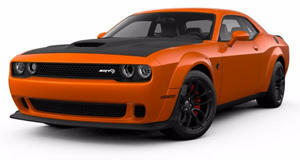 Someone (and they surely won’t be the last) is hoping to sell a 2018 Dodge Challenger Demon on eBay for – here it comes – $250,000. As the seller correctly points out, a fully-loaded Demon will cost just under $100,000, but how did he come up with that quarter-million dollar figure? The $100k "is the price before tax and before the inevitable huge dealer markup IF you can even get one at all," the seller writes. "They are only making 3,300 total (3,000 for the US) for only ONE year and this is your chance to own one." Again, all true, but here’s the strange part: the seller states "upon purchase we will discuss exactly how you would like to order your car if you purchase before the order date. If you purchase AFTER the order then you will get the car with the options I choose." Right, okay. So this mystery seller somehow already has an order reserved and he’s supposedly selling that order for profit? Makes sense, but what he fails to list is that "order date." Honestly, this whole thing is a bit off. Yes, it’ll be hard to even get a spot in line to buy a Demon, and yes, taxes and dealer markups are all but guaranteed, but $250k still seems steep, especially from a private seller.